Keith Wood in his playing days. 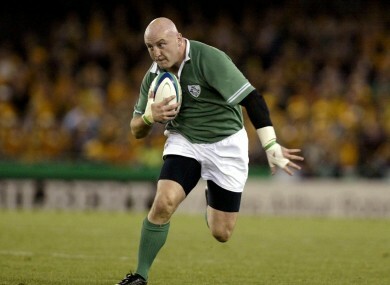 FORMER IRELAND CAPTAIN Keith Wood has been inducted into the IRB Hall of Fame. Wood, who was capped 58 times for Ireland, is the seventh Irish player to achieve the accolade after Jack Kyle, Willie John McBride, Syd Millar, Tony O’Reilly, Mike Gibson and Ronnie Dawson. The 42-year old scored 15 times for Ireland and captained the side on 36 occasions, appearing in three World Cups and twice touring with the British and Irish Lions. He was also the very first winner of the IRB Player of the Year award back in 2001. This year’s Hall of Fame class is ground-breaking as it the IRB’s list includes women players for the first time. Nathalie Amiel (France), Gill Burns (England), Patty Jervey (USA), Carol Isherwood (England), Anna Richards (New Zealand), Farah Palmer (New Zealand), Keith Rowlands (Wales), Jim Greenwood (Scotland), JPR Williams (Wales), Michael Lynagh (Australia), Jo Maso (France), Keith Wood (Ireland), Ieuan Evans (Wales), Jason Leonard (England) and Bill Beaumont (England). Email “Keith Wood inducted into IRB Hall of Fame”. Feedback on “Keith Wood inducted into IRB Hall of Fame”.